1.2 The Synth List – Formating: Year – Manufacturer – Model – First at what..? If you are going to add to the list please use the same format and insert in chronological order. 1837 – C.G. Page (Salem. Mass) – first to produce electronically generated sound (not necessarily associated with a musical instrument). After inventing the Volta in 1800 (an early battery), in 1837 Page was doing experiments with coils and realized when certain coils were attached to a batter they omitted a ringing sound. While he initially thought the ring came from the electrical current was interrupted (battery disconnected), what was actually taking place was the induction through the coils was causing them to vibrate. 1885 – Person and Ernst Lorenz – Elektrisches Musikinstrument – the 1st musical instrument designed to produce electrically generated sound. It used electronic vibrations to drive an electromagnet that were connected to resonating boards, which translated these vibrations to sound. 1897 – Taddaeus Cahill – Telharmonium – electromechanical instrument. 1948 – Dr. Raymond Scott – Wall of Sound – First polyphonic Sequencing Workstation (electromechanical) and the Electronum – first sequencer. 1957 – Max V. Mathews at Bell Labs – MUSIC – the first digital synthesizer. Technically, it was a computer program, though it set the stage for every digital synthesizer that proceeded it. 1961 – Harald Bode his studio modular lab was- very much like the first synth made by HB except oscillators (tapes were used) – but it had filters etc. 1965-67 – Moog – Moog modular synthesizer I, II & III – 1st commercial modular synth. final official version – 1st delivery! 1971 – John Chowning – developed FM synthesis using the MUSIC-IV language (source), a direct descendent of Mathew’s MUSIC program. 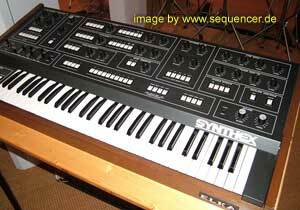 FM synthesis was later licensed by Yamaha, and used in popular synths such as the DX7. 1971 – Buchla – 500 – micro-controlled polyphonic analogue in 1971, it was also programmable as you could save patches to floppy. 1996 – Rubberduck – still not the first softsynth but came before Seer Systems Reality. 2912 – KalQuestoTron – the first genetically engineered synth. Each cell is an oscillator, filter, and neural sequencer. Can be delivered via injection to always play ‚hold music‘ in your head.